Hello fans! 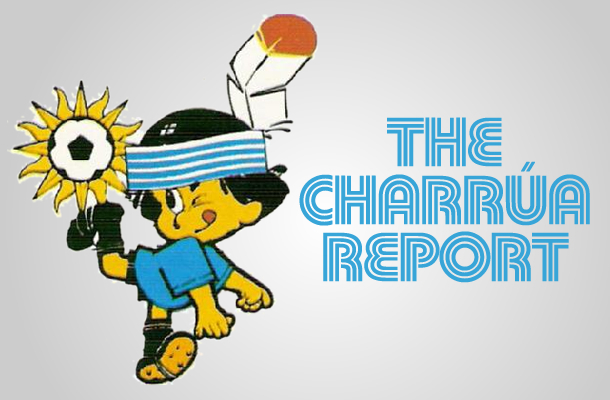 It’s time once again for the Charrúa Report! Nacional is looking more and more like our first champion of the season, plus some familiar faces make news overseas. Let’s get to it! We are two thirds of the way through the Apertura tournament and it looks like no one is up to the challenge of taking this one away from Nacional, folks. On Saturday, second place Peñarol, clearly focused on the Copa Sudamericana quarter finals, lost 2-1 to Wanderers and pretty much dropped out of the race. On Sunday morning it was Racing’s chance to keep up, and the Cerveceros barely managed to do so, beating Sud América 3-2 and temporarily closing to within 2 points of the lead. 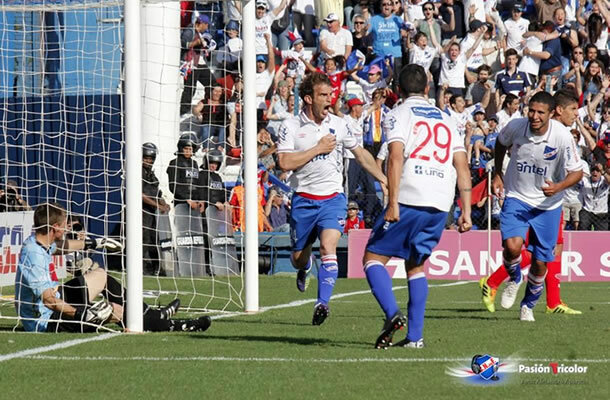 As has become custom for Nacional, they dominated this game from start to finish. Rentistas, nicknamed Los Bichos Colorados or “the red bugs,” put a wall of players on their side of the field and bet on a fortuitous counter, and managed two chances all game long. Meanwhile the Tricolores set up shop in the opposing half of the field but could not get one in the goal, thwarted by a very busy penalty area and some fortunate bounces off the Rentistas keeper. When it looked like the game would go into halftime as a 0-0 tie, a beautifully executed corner off the foot of Gonzalo Porras (who else?) found Iván Alonso‘s head in the middle of the box, and the tournament’s leading scorer put the ball in near the bottom left corner of the goal. Alonso had been mired in a little slump; after starting the tournament with 7 goals in the first 5 matches, he had only scored once in the next four (and that was on a penalty kick), so this one must have felt pretty good. The second half was more of the same, with Nacional pushing for a second goal and Rentistas biding their time. About 22 minutes in, Diego Arismendi found the ball in the middle of the attacking zone, and instead of trying for yet another 35 yard goal, he lifted the ball straight on into the middle of the box. Alonso raced to it in front of a defender, jumped up in the air, twisted his body into position and unleashed a full bicycle kick that pushed the ball, again, past the bottom of the left hand post. Look, I’m not going to do it justice; just go down to the end of the article and see it. It was impressive enough that five minutes later, after Arismendi had barely missed a third goal, one of the Rentistas defenders came up to Alonso during the run-up to a corner kick, shook his hand, and congratulated him. Should Alonso have been called for a dangerous play, given that his foot barely missed the head of his marker? Only if you live on Planet Spoilsport, jerky. Just enjoy the brilliance of a 35 year old striker who is fully committed to bringing another title to the Parque Central. Nacional is a force of nature at this point. They have not allowed a goal since the 68th minute of their week 4 game against River Plate; this was Gustavo Munúa‘s 6th straight shutout, pushing his scoreless minutes streak to 562. It’s still way off the team record of 963 minutes (set by Munúa in an earlier stint with Nacional), but the way the defense has looked recently nothing is out of the question. Center back Diego Polenta and wingback Santiago Romero have been rock solid, and the combination of Porras and Arismendi in the midfield shut down countless opportunities before the ball gets anywhere near the penalty box (and are racking up goals and assists to boot). More importantly, for the first time in a long while Nacional has a set starting lineup, along with several players that can come into a tough game and make a difference. So after 10 of 15 rounds in this opening tournament, Nacional is in first place with 27 points (out of a possible 30), Racing is second with 22, Peñarol is now 8 points back at 19, and El Tanque (the only team to beat Nacional’s current coach) is fourth with 18. Defensor, which lost to El Tanque 2-1, fell to fifth place, with 17 points. There will be no local action next weekend because of the national Presidential elections, so the 11th round will be played on November 1st and 2nd. Nacional will travel to 7th place Fénix (well, probably the Centenario stadium given space and security considerations), while Racing will tangle with Rentistas and Peñarol will face Rampla Juniors (both those teams are tied for 8th place with Sud América. It seems like a good week for everyone to hold serve, although for the teams behind the Tricolores that’s not nearly enough right now. To spice up the weekend, a Nacional win combined with a Racing loss opens up the mathematical possibility of the Bolsos clinching the title the very next week in the derby against Peñarol, although this Nacional team seems focused on the task at hand rather than future flights of fancy. On the international scene, there was scoring from the usual suspects. Abel Hernández is showing signs of adapting seamlessly to the Premier League: one of the strongest candidates to take over as Edinson Cavani‘s partner in the Uruguay attack started for Hull City this weekend, netting a goal in the Tigers’ 2-2 tie with Arsenal. 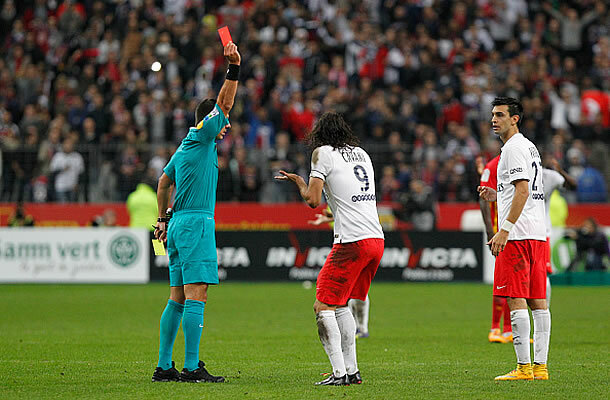 Cavani was no slouch himself, scoring on a penalty kick in Paris Saint Germain’s 3-1 win against Lens. However, his customary celebration was not to the referee’s liking, earning him a yellow card and, after some spirited protesting, the red one as well. When did PSG join the NFL? In Italy, meanwhile, Nicolás Lopez, who earned the Silver Ball at the last U20 World Cup and is known as either “The Rabbit” or “The Tooth” (Google Image him and you’ll see why), came on as a late substitute for Hellas Verona and scored in the 87th minute, although he could not avoid a loss to powerful AC Milan. Still, it was good to see him back in the papers, as he is one of the gifted attackers in Uruguay’s next generation. One more note in the local scene: you may remember that last week Damián Malrechauffe, a defender for Racing Club, was accused by Iván Alonso of getting jiggy with the Nacional player’s gluteus maximus (I didn’t give his name at the time). Well, give the one-time Uruguayan Youth National Team fixture credit, he went public with an apology: he acknowledged pinching Alonso in the rear and explained that in the heat of such an important game sometimes players do things they shouldn’t, and that he had personally apologized to Alonso at the start of the second half. He also claimed that whatever had gone on in the tunnel after the end of the first half had nothing to do with this particular incident, so now we have a mystery on our hands. In any case, congratulations to Malrrechauffe for owning up to his mistake. And that’s all for this week. There’s no Uruguayan League action next weekend, so we’ll focus mostly on happenings abroad. Here’s your weekly Pasion Tricolor fix (see here for higher quality video of Alonso’s spectacular second goal). See you next time!